David Raybin | Raybin & Weissman, P.C. Dave was extremely professional but more importantly I was treated as a person not a case. He always returned calls and emails in a very timely manner. - Jennifer S.
I am overwhelmed with the professionalism and the zealousness with which you [David and Ben Raybin] helped my son. An amazing job all around! My family is forever indebted.-M.V. Mr Raybin is the very best attorney one could hope for. He was attentive, responsive, knowledgeable, thoughtful and effective. We could not have been in better hands and have enormous respect for him. -K.K. I simply cannot thank you enough for what you have done for the D. family. Your expertise was beyond more than any of us could have hoped for, but more than that your patience, effort and friendship helped take us all over a very dark period in our lives. -J.D. With more than 40 years of experience, David Raybin heads the criminal defense section of our firm, which includes criminal trials, criminal appeals, parole hearings, and civil rights litigation. David has been named the Best Criminal Lawyer in Nashville in criminal general practice and white collar defense by Best Lawyers in America, and listed among the Best Criminal Lawyers in TN by Tennessee Business magazine. A regular commentator on local legal subjects, David often deals with prominent cases you may have read about in the news. 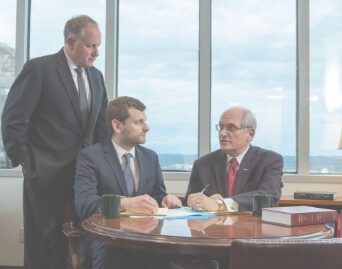 In addition to cases in the trial courts, David has successfully handled significant criminal appeals throughout Tennessee. A prolific writer, David has authored numerous articles and publications. He wrote the book Tennessee Criminal Law, which has been cited hundreds of times by Tennessee courts and relied on by judges and attorneys throughout the state. David’s criminal defense representation includes cases concerning murder and other homicides, sexual assault, drugs, domestic violence, white-collar fraud, and computer sexual image cases. David also handles cases involving students arrested at local universities—such as Vanderbilt, MTSU, Fisk, Lipscomb, Belmont and TSU. Contact David Raybin and the law firm of Raybin & Weissman for a confidential consultation of your case today at 615-256-6666.